Reality TV World: Okay, so that explains you being "super pissed" at Nick then for flipping. (Laughs) Do any of those hard feelings toward Nick still remain? Is that a sore subject? Lyrsa Torres: You know what's funny? I know it's very difficult for a lot of players that once you're voted out, you're gone. And people sometimes get it well, like I did, and some people stay bitter. And once I was voted out, I'm out. There's nothing I can do but keep walking and keep going forward, like, this decides for you. You are playing a game. I can't be mad at you because you played the game. That's the premise of this show; we are here to win, and you have to play for that. So was I a little bit sad because he voted for me? Of course. But I can't blame him. I mean, after all, this is a game. This is a game. I can't be mad at you for playing. It's fine. I don't have no hard feelings towards anybody. I really love everybody, even the people I didn't get to play with. I love [John Hennigan]! Oh my God, every night, we watch him [wrestle] because we're obsessed with him, and I feel so bad I didn't make the merge just to meet Johnny and [Alison Raybould] and [Kara Kay] and [Alec Merlino], and all of these fantastic people I didn't get to play with. Reality TV World: While you were in the game, were you aware Mike White was so conflicted with the vote? And looking back, do you think you could have said or done anything to convince him to keep you? Lyrsa Torres: No, Mike and I -- what you guys didn't see -- is Mike and I had a really great connection. We talked a lot, we have the rainbow coalition. As soon as we got the buffs out on that swap, I was very bummed I was not going to be with [Elizabeth Olson] or [Gabby Pascuzzi] or [Christian Hubicki], but I was so excited that I was going to be with Mike because I have seen him on The Amazing Race and I was rooting for him [to win] The Amazing Race. So I was starstruck, not because of the movie, but mostly because he was someone I saw on The Amazing Race and he was like the underdog. So I was so excited about this, and he told me the whole time, "I don't want to vote you out because I really like you and I want to keep you and I really enjoy being with you and having these conversations and we can be honest and I can be as gay as I want." He was like, "I can be as gay as I want and you'll be comfortable with that." But I really understand he was conflicted because of the Goliaths: "What are they going to think about me? Are they going to hate me?" And so I do understand the decision. I was very, very aware he was conflicted with this vote and it was a 50/50 chance. Reality TV World: Were you aware of the fact Mike and Nick were so close in the game? Nick, in fact, called Mike his "best friend" in the latest episode. Lyrsa Torres: I didn't know they were BFFs. I was not aware of that! But when we got there, it was mostly Nick, Mike and I. You guys didn't see that, but we had a connection. We were joking all the time and we were having a blast together. But I didn't know they named their alliance. I was pretty pissed at Nick because he never named anything with me, and I didn't really know that they were that close, like BFF friends. Reality TV World: Given a Goliath was voted out at the first two Tribals following the swap, what did you expect was going to happen come the merge? Did you think the game would become David vs. Goliath again and loyalties would break apart? Or maybe you thought the original Goliaths would split but the Davids would remain strong and united? Lyrsa Torres: I think that merge is going to be mayhem and a cow! We have so many big personalities that I really don't know what's going to happen! I'm so looking forward to seeing how this is going to play out, because you have so many great players, who are very into the game and they are there to play. So it's going to be very entertaining to see that. I think there are going to be some clashes because of the David and Goliath thing. So at the merge, we'll now see the true colors of people and whether they're going to stick to their original thing or be like, "Game on, this is individual. I'm going to play for myself and do what's best for me." Reality TV World: Mike feared the tribe's vote could be "a fatal decision," and he just hoped that wouldn't be the case. At the time you left the game, did you think this decision was going to be fatal? Lyrsa Torres: I think gameplay, yes, because I was being honest with Mike. I really liked Mike. I really like him; he's amazing. I love Mike! And I think I was going to try and save him if we, the Davids, had the numbers. If we were going to stick together at the merge, I was going to bring him in. And I knew that I had Gabby and Christian and I had Elizabeth. So they were going to listen to me and analyze that, and I would've put that out there. So I think it was a little bit of a mistake... but I did the most I could. It's a game; it's a game of chances. And we'll see if he made the right decision. 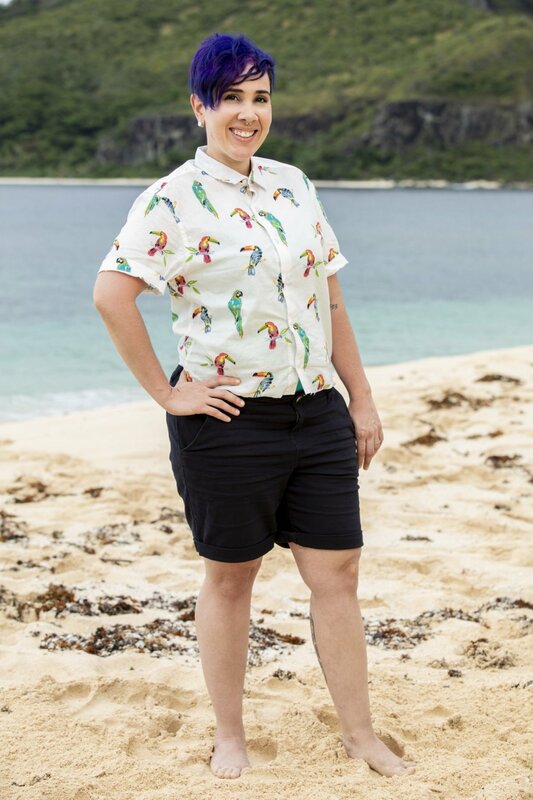 To read the first portion of Reality TV World's exclusive Survivor interview with Lyrsa, click here.